Wanda Pascal travelled to Edmonton last weekend to get a glimpse of one of her favourite country music artists, Jessi Colter. Pascal wanted to give Colter a piece of her Indigenous heritage. A concert-goer's experience turned into a memorable life moment for the chief of Fort McPherson, N.W.T. 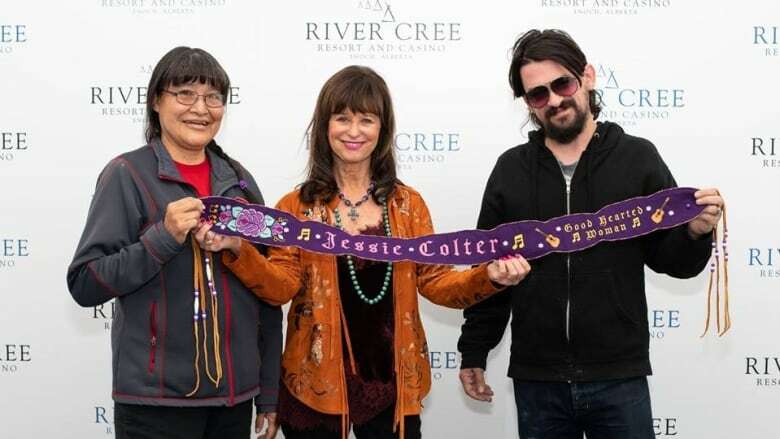 Wanda Pascal travelled to the River Cree Resort and Casino in Edmonton last weekend to get a glimpse of one of her favourite childhood country music artists, Jessi Colter. As a sign of kindness, Pascal wanted to give Colter a piece of her Indigenous heritage. Pascal created a purple guitar strap made out of beads and moose skin with the words "Jessie [sic] Colter, good hearted woman" stitched in fabric. Pascal said she knew Colter was Indigenous and so she figured the gift would be symbolic. "I drew a flower and then I took it to the canvas shop [to] get writing on it, then sew it together." Colter is an American country music artist, known for her collaboration with her husband, country singer and songwriter Waylon Jennings. At first, Pascal said she wasn't sure if she would be able to present the strap to Colter. She said she initially took it to Colter's marketing manager who then brought it backstage after the performance. After showing the strap to Colter, the manager came back to Pascal and said the country singer would like to receive the guitar strap from the artist herself. "'You're going to do it, you're going to take it back to her,'" Pascal said the manager told her. She was then given a backstage pass. Pascal said excitement was building that she was actually going to meet one of her favourite musicians since childhood. "When we went in I thought, 'oh my God I'm meeting Jessi Colter,'" she said. She said Colter's son, Shooter Jennings, who's also a singer, was there. "He looks like his dad, Waylon Jennings," Pascal said. Once she was backstage, Pascal said the two talked as if they knew each other for years. "She told me she was part Apache Indian," said Pascal. Pascal said Colter was extremely grateful for the gift. The singer told Pascal that she isn't going to use the guitar strap — instead she's going to hang it on her wall.